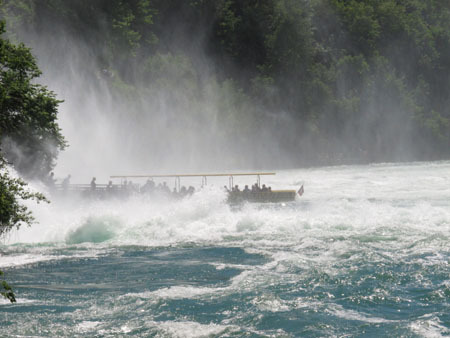 Boats take visitors right up to Rhine Falls. The spray from Rhine Falls drifted in the breeze, settling fine droplets of moisture on our faces and creating a faint rainbow across the water. For centuries, tourists have flocked to Europe’s largest waterfall, awed by the wide surge of water over a limestone ledge. 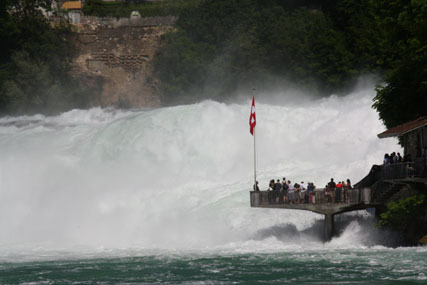 We joined the throngs of people at this popular site when visiting with my son’s family in Switzerland. Located in a bend of the Rhine River near Schaffhausen in northern Switzerland, Rhine Falls can be accessed from either side of the river. It’s not the tallest falls but rather the broadest at 492 feet and the largest by volume of water that pours over the rocks. At the highest point water drops about 69 feet, but you can still feel the vibration when walking on the designated path. And it makes an excellent backdrop for photos. Stairs lead to the top of the rock in the Rhine River. When tectonic shifts during the Ice Age forced the Rhine River into a new riverbed, the falls were created at the transition point where hard chalk turned into soft gravel. In the middle of the river stands an imposing rock, a pillar that has survived the elements for thousands of years. A narrow winding stairway leads to the top of the rock, which so intrigued us that we took a boat ride to the rock in order to climb up. Although it was very crowded on the day of our visit, we still had great views of the falls and the lake. The turreted castle Schloss Laufen on a cliff directly above the falls added to the spectacle. Be prepared to get wet on the observation deck. Boats on the river offer several different cruises. 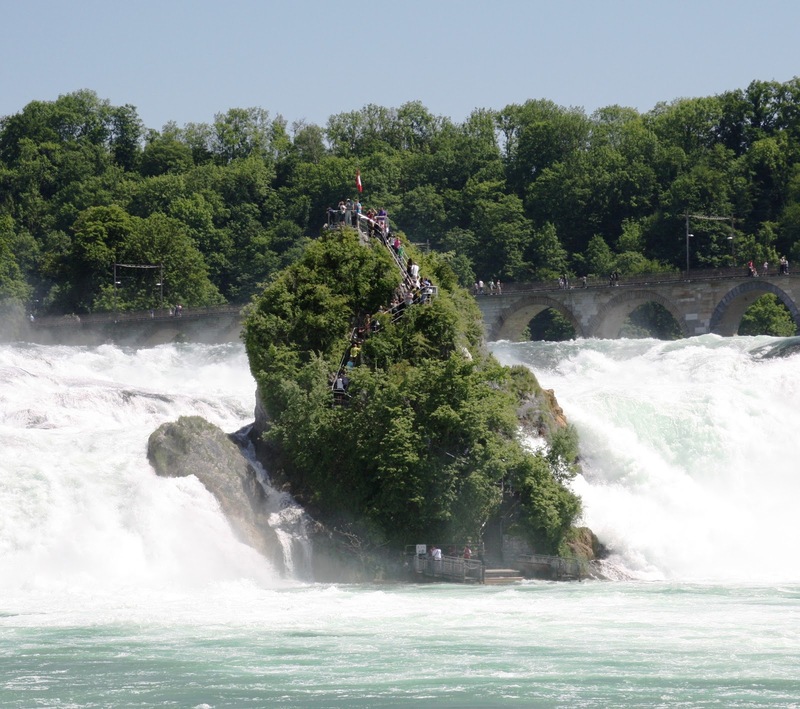 One tour will take visitors to an observation deck on the Zurich side that juts out over the river for a bird's-eye view of the falls. We weren’t quite daring enough to paddle a canoe close to the falls but watched one boat take passengers right up to the surging water. Other amenities include a visitors' centre, children's playground and the Historama, an interactive exhibition about Rhine Falls. Stein on Rhine is a typical Swiss village. 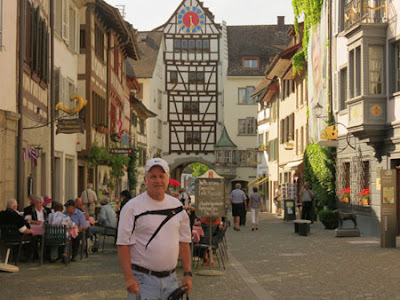 After our boat ride we stopped for ice cream before heading back up the path and on to Stein on Rhine, a typical Swiss village with a well-preserved medieval center open only to pedestrians. The site of the city wall, which now consists of houses, and the city gates are also preserved. Since the weather was just about perfect, many people sat outside enjoying al fresco restaurants and cafes. We walked around admiring the charming gingerbread architecture, fountains, and beautiful frescoes painted on buildings—and smiled at children scaling a wall to dip their bodies into the cool river. It didn’t matter that we weren’t alone in soaking up this iconic Swiss adventure; in fact, sharing the scene made it even more likeable.